Being able to consume organic foods only and avoid the negative consequences of genetically modified or pesticide-exposed versions would be excellent for our health. The procedure is easy, convenient and inexpensive, and the benefits of a diet rich in such healthy products are countless. When you regrow the kitchen scraps you get from fruits and veggies, you do Mother Nature a great favor. We all know that recycling has been around for a long time, and it is one of the original ways a household can help in reversing climate change. If you grow your food, or at least some leafy veggies and fruits like tomatoes and apples that you use for snacks or even an ingredient for your dinner, then that’s money in the pocket. Plus the fact that it is very easy to do in the kitchen too. You can use extra cups and bowls lying around in the kitchen to start your project. If you want to eat organic, it is a great idea to grow organic. You can be sure of what you eat since you, yourself grew it in the comfort of your home. The beauty of growing from food scraps is that you can see the progress every day. Cut off the parts of the room which are about to start, and plant the ginger piece about 3-5 inches in the soil, with its rhizome pointing upwards. Water it regularly. Cut the flowery “crown” off the pineapple, about an inch below the leaves, trim around the bottom, dehydrate the crown, and then put it in a shallow container of warm water. As soon as it starts to root, replant it into a container with soil, placed in a warm, sunny place, and water it once a week. Plant a mint clipping 3″ deep in a 5-8″ pot of damp soil, which will be exposed to sunlight. It will flourish in a few weeks. Plant the seeds in a mixture of peat moss, vermiculite, and sand, push them just below the surface of the soil. The pot should be exposed to sunlight, and water when the soil is slightly dry. Plant the bottom end of an onion directly in the soil, water when needed, and in about a month, the onions will root and sprout leaves. Place 5-6 inch cuttings in water and within a few weeks, there should have rooted, make a 3” hole in a 4″ pot filled with damp potting soil, place the cutting inside, and water only when the soil is dry. Keep it in a place with direct sunlight. In a bowl with a ½ inch of warm water, place the base of it, and leave it in direct sunlight for a week or two. Afterward, transplant the new lettuce leaves to the soil, and in about a month, they will fully grow. Put the green shoots in some water, under a lot of sunlight and you will grow a bunch of garlic sprouts. Leave at least an inch attached to the roots of your leftover product, put them in a small glass of water, and the new scallions will flourish. Place 4” basil clipping stems in a glass of water, exposed to direct sunlight, and when they grow two inches, transplant them in a pot. Cut a cleaned sweet potato in half, place it half in a jar, using toothpicks, and it will sprout slips in a few days. Remove them, put them in water, and they will grow roots. Plant them in loose, well-drained soil and water, and water them regularly. Cut a potato with many slips into 2-inch squares with each piece having a couple of them, and leave them out in room temperature for a few days. Place the cubes 8″ deep with the slips facing upwards in a deeper pot, cover it with another 4″ of soil, and add soil as the roots start to grow. Plant an organic lemon in a planting pot that’s 6″ wide and 6″ deep, transplant it into a seedling pot that is 24″ wide and 12″ deep, and make sure it grows in a sunny area. Mushrooms can be regrown from spores in the comfort of our home. In a container with some water, place chopped off carrot tops, and they will soon sprout greens. Keep the carrots halfway in the water using toothpicks until they root, and then plant them in your garden. Cut off the tops and place them in a shallow container with water for a few weeks. 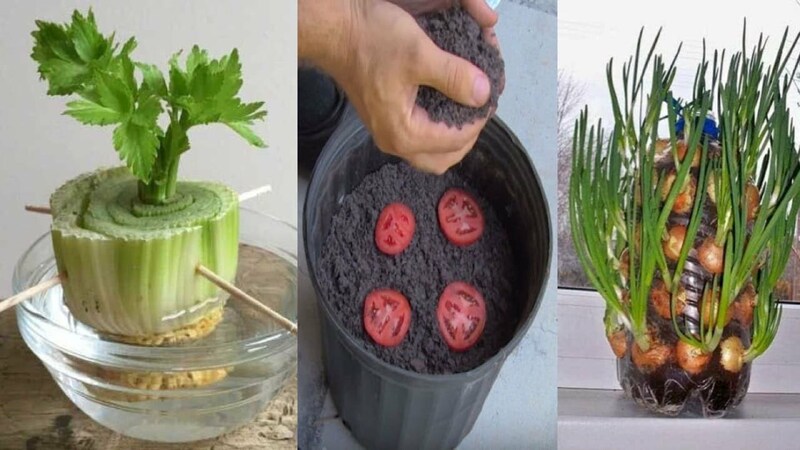 After sprouting, plant them outside. You can regrow new tomato plants that can reach up to 8” feet. Ease the tomato plant out of its pot, trim the low leaves, and place it in a hole, fill it with soil, and do not compress it much. Cut off the celery base and leave it in a bowl with some warm water. Place the bowl in direct sunlight, and after a week, it will grow leaves. Next, transplant it in the soil. Leave the cabbage head in an inch or two of water in a well-lit area and it will regrow very soon. You can successfully grow an avocado tree from just one avocado pit.